MESQUITE, Nev. (AP) — Stephen Paddock lived in a tidy Nevada retirement community where the amenities include golf, tennis and bocce. He was a wealthy real-estate investor, recently shipped his 90-year-old mother a walker and liked to play high-stakes video poker in Las Vegas. Nothing in his background suggests why he would have been on the 32nd floor of the Mandalay Bay Hotel and Casino with at least 17 guns on Sunday night, raining an unparalleled slaughter upon an outdoor country music festival below. Law enforcement and family members could not explain what would motivate a one-time accountant with no known criminal record to inflict so much carnage. Paddock had apparently planned the attack in great detail, including showing up at the hotel with at least 10 suitcases. "I can't even make something up," his bewildered brother, Eric Paddock, told reporters Monday. "There's just nothing." At least 59 people were killed and nearly 530 injured in Paddock's attack on the Route 91 Harvest Festival, where country music star Jason Aldean was performing for more than 22,000 fans. It was the worst mass shooting in modern U.S. history. The 64-year-old gunman killed himself in the hotel room before authorities arrived. The Islamic State group claimed responsibility, without offering evidence, but Aaron Rouse, the FBI agent in charge in Las Vegas, said investigators saw no connection to international terrorism. Asked about a potential motive, Sheriff Joseph Lombardo said he could not "get into the mind of a psychopath at this point." Public records offered no hint of financial distress or criminal history, though multiple people who knew him said he was a big gambler. "No affiliation, no religion, no politics. He never cared about any of that stuff," Eric Paddock said as he alternately wept and shouted. "He was a guy who had money. He went on cruises and gambled." Eric Paddock also told The Associated Press that he had not talked to his brother in six months and last heard from him when Stephen checked in briefly by text message after Hurricane Irma. Their mother spoke with him about two weeks ago, and when he found out recently that she needed a walker, he sent her one, Eric Paddock said. Eric Paddock recalled receiving a recent text from his brother showing "a picture that he won $40,000 on a slot machine. But that's the way he played." He described his brother as a multimillionaire and said they had business dealings and owned property together. He said he was not aware that his brother had gambling debts. "He had substantial wealth. He'd tell me when he'd win. He'd grouse when he'd lost. He never said he'd lost $4 million or something. I think he would have told me." Heavily armed police searched Paddock's home Monday in Mesquite, about 80 miles northeast of Las Vegas near the Arizona border, looking for clues. Paddock lived there with his 62-year-old girlfriend, who authorities said was out of the country when the shooting happened. Eric Paddock described her as kindly and said she sometimes sent cookies to his mother. Police also searched a two-bedroom home Paddock owned in a retirement community in Reno, 500 miles from Mesquite. So far, Paddock doesn't seem like a typical mass murderer, said Clint Van Zandt, a former FBI hostage negotiator and supervisor in the bureau's behavioral science unit. 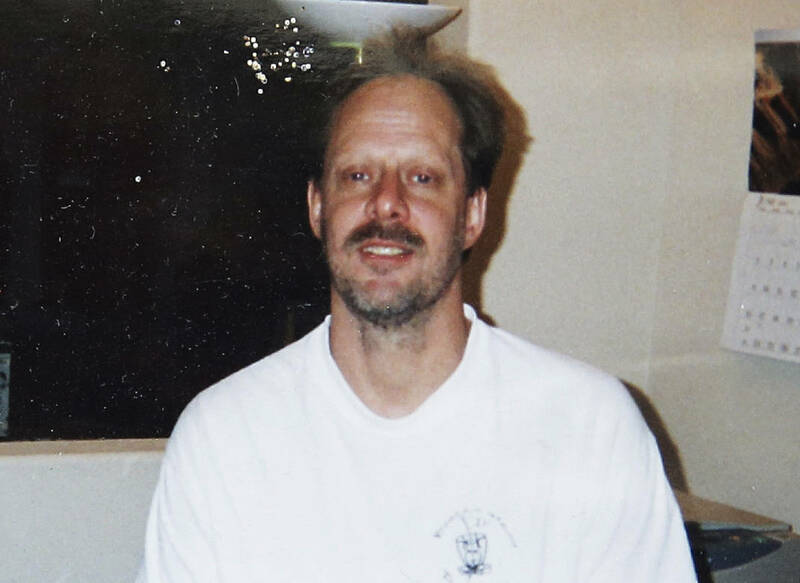 Paddock is much older than the typical shooter and was not known to be suffering from a mental illness. "My challenge is, I don't see any of the classic indicators, so far, that would suggest, 'OK, he's on the road either to suicide or homicide or both," Van Zandt said. Nevertheless, his actions suggest that he had planned the attacks for at least a period of days. Some of the rifles had scopes, the sheriff said. And two were modified to make them fully automatic, according to two U.S. officials briefed by law enforcement who spoke on condition of anonymity because the investigation is still unfolding. "He knew what he wanted to do. He knew how he was going to do it, and it doesn't seem like he had any kind of escape plan at all," Van Zandt said. While Stephen Paddock appeared to have no criminal history, his father was a notorious bank robber, Eric Paddock confirmed to The Orlando Sentinel. Benjamin Hoskins Paddock tried to run down an FBI agent with his car in Las Vegas in 1960 and wound up on the agency's most wanted list after escaping from a federal prison in Texas in 1968, when Stephen Paddock was a teen. The oldest of four children, Paddock was 7 when his father was arrested for the robberies. A neighbor, Eva Price, took him swimming while FBI agents searched the family home. She told the Tucson Citizen at the time: "We're trying to keep Steve from knowing his father is held as a bank robber. I hardly know the family, but Steve is a nice boy. It's a terrible thing." An FBI poster issued after the escape said Benjamin Hoskins Paddock had been "diagnosed as psychopathic" and should be considered "armed and very dangerous." He'd been serving a 20-year sentence for a string of bank robberies in Phoenix. The elder Paddock remained on the lam for nearly a decade, living under an assumed name in Oregon. Investigators found him in 1978 after he attracted publicity for opening the state's first licensed bingo parlor. He died in 1998. Stephen Paddock bought his one-story, three-bedroom home in a newly built Mesquite subdivision for $369,000, in 2015, property records show. Past court filings and recorded deeds in California and Texas suggest he co-owned rental property. He previously lived in another Mesquite — the Dallas suburb of Mesquite, Texas — from 2004 to 2012, according to Mesquite, Texas, police Lt. Brian Parrish. Paddock owned at least three separate rental properties, Parrish said, and there was no indication the police department had any contact with him over that time. He has been divorced at least twice, including marriages that ended in 1980 and 1990. One of the ex-wives lives in Southern California, where a large gathering of reporters congregated in her neighborhood. Los Angeles police Sgt. Cort Bishop said she did not want to speak with journalists. He relayed that the two had not been in contact for a long time and did not have children. In 2012, Paddock sued the Cosmopolitan Hotel & Resorts in Nevada, saying he slipped and fell on a wet floor there. The lawsuit was eventually dismissed by a judge and settled by arbitration. Reached by telephone, Paddock's lawyer at the time, Jared R. Richards, said he could not comment because of client confidentiality concerns.